Our Fudge is made with wholesome, fresh ingredients! Packaged with care, so it will leave our kitchen and arrive fresh at your house. 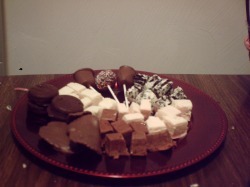 Our FUDGE is made after it is ordered and paid for, to ensure freshness! So many choices to choose from. Click the FUDGE button on the side of the page to go to the flavors to choose from!